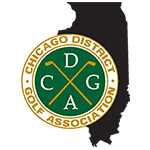 NORTH RIVERSIDE, Ill. (Sept. 12, 2018) – Quick greens and thick rough stymied the Illinois State Senior Amateur field Wednesday at Riverside Golf Club, as a trio of golfers lead at 3 over after the opening round. Daniel Brassil of Chicago, Cory Scott of Galesburg and Tim Sheppard of East Peoria all vaulted to the top of the leaderboard with rounds of 74. Scott, with his son Jake on the bag less than a month after they advanced to the quarterfinals of the CDGA Amateur Four-Ball Championship at Mistwood Golf Club, went out in 34. However, he started his back nine with three consecutive bogeys en route to a finishing 40. Sheppard similarly struggled with the flat stick, as he was unable to capitalize on an excellent ball-striking day. The entire field will play 18 more holes on Thursday, with the low 35 and ties advancing to Friday's final round. A low super senior, age 65 and older, will be crowned at the conclusion of play on Thursday.